Keep Calm and...Tone It Down. The first time I saw something in this vein was in a bookstore, but the one I saw said “Keep Calm and Have a Cupake,” a sentiment which I fully support. I laughed on the inside, considered buying a notebook, then decided it wasn’t worth it and moved on. Since then, and in large part to Pinterest, I have seen countless variations on this phrase, and as of recently I have come to the conclusion that it is wildly out of control. Freak out and throw stuff. Now, I’m not mad at these people. In fact, I’m not really even annoyed. I’m just tired. I really don’t think I can handle any more, and frankly, does anyone still think this is cute? Also, did no one copyright this? Seems like someone is missing out on a major money-making opportunity here. 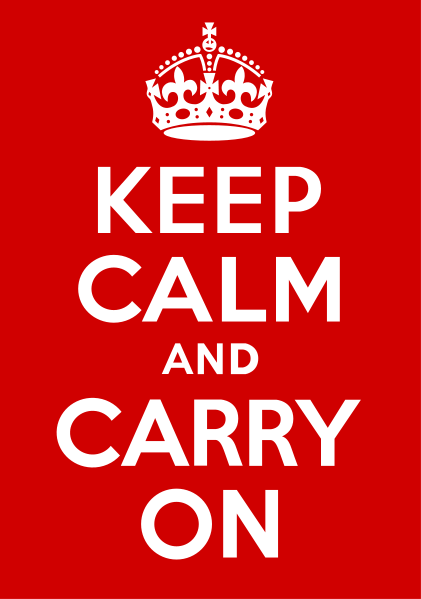 EDIT: Okay, when searching for the image above, I learned (via Wikipedia, the source of all useless knowledge) that this poster actually originated during WWII from the British government in an attempt to boost morale of the British public. And now the design is in the public domain. Hm. Who knew? And look what it has become. This post somehow just got totally sad. Sorry for the bummer, guys. Did anyone else know about the WWII reference? What do you think—time to let it go, or is it still solid?